At almost all SCA events, participants are given a "site token" - an item which shows that they have paid the fee to get in (usually between $5-12 for a day of awesome!) and is something to take home with them to remember the event by. There are a number of different opinions on site tokens and their value. Some people love collecting them. Others find a lot of them to be well made and neat, but also essentially just another trinket to throw in a box and forget about. One way to circumvent this issue is to try and come up with site tokens that have a specific use. This can be difficult to do for a reasonable price, but it doesn't have to be. I made over 300 site tokens for last year's 12th Night event for $38. In part this was because some of the materials were donated (and all the labor was), but also because they were made from simple materials. From another project I had several bags full of cedar wood shavings, which I turned into small cedar satchels to go into armor bags or garb chests! Cedar smells wonderful, and also works as a vermin reducer, as moths and insects tend to not like it. These site tokens were made to be used after the event, in order to keep your garb or armor smelling just a little bit better and helping to keep the bugs out of them at camping events. The bulk of the cost was in purchasing the fabric and a couple spools of thread. 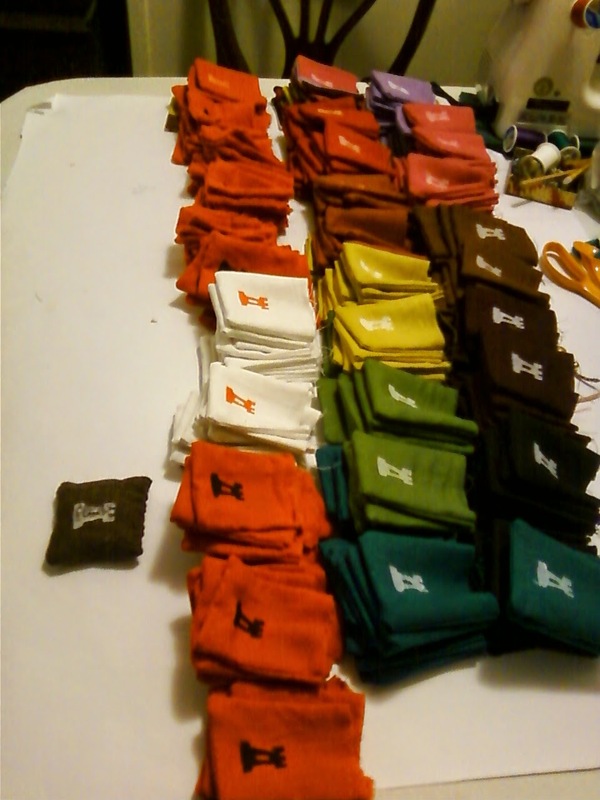 I bought eleven different colors of the linen/rayon mix fabric commonly found at JoAnn's when they had a 40% off linens sale. This covered the initial estimate of making 200 site tokens. When that number was bumped up to 300 (Royalty announced that they were coming to our event! ), Ann donated a piece of red linen material that she didn't want anymore. The linen was cut into 4" by 4" squares. Three sides were sewn with a machine, and the pouches were turned right-side out. 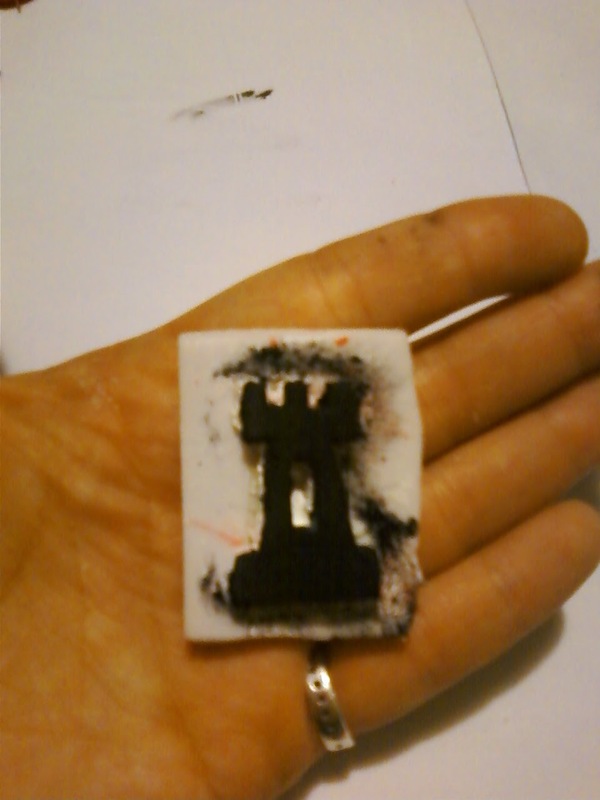 Below is a picture of the stamp that I made by cutting a tower out of some craft foam and then gluing that to another piece of foam for the backing. The stamp was painted with a brush and pressed into each pouch to add our local heraldry to the tokens. I donated a small amount of black and white acrylic paint (I have a lot of paint). After being stuffed with cedar shavings, the tops were sewn shut with a variety of embroidery stitches. I wish I had remembered to take a photo of the pile of finished tokens - they were so much fun to make and look at in their variety of colors and patterns! The embroidery floss was donated by several members of our local group. Finally, a small tie was added to the top corner of the pouches. This allows people to be able to loop the site token onto their belt at the event. These were a lot of fun to make, and I definitely didn't make them all by myself - thank you to the others who helped me make them! 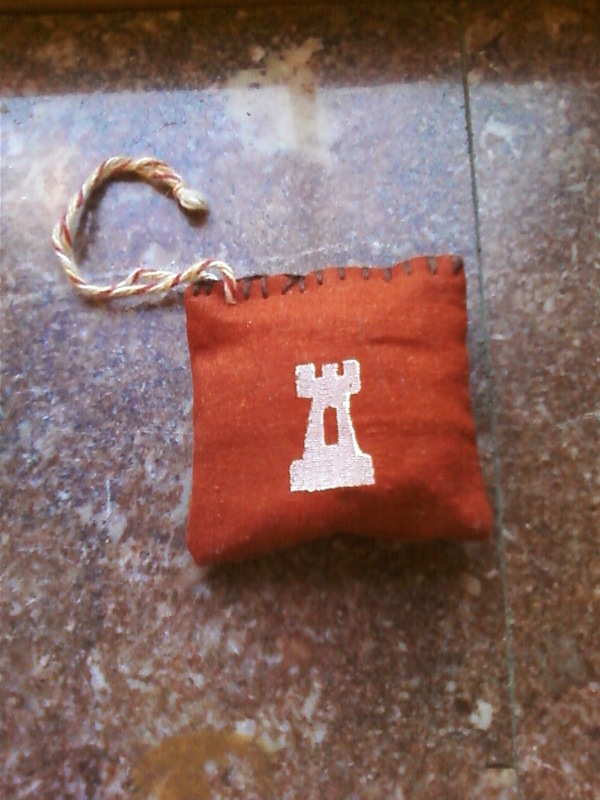 I would be happy to make a similar site token again - who doesn't need more cedar satchels? Cedar makes garb smell lovely! Anyone have any other ideas for useful site tokens? Let's brainstorm! One other thought I had is inspired by the Baron and Baroness of Northwoods, who handed out blue washcloths to fighters at Pennsic last year. I bet something like washcloths for fighters or napkins for feast gear would probably not be too expensive to make, especially if you raided thrift stores to find cheap linens to make them out of. How would you decorate them to show the event? Embroidering all of them would probably be too much effort for a large event. How do painted stamps hold up in the wash? 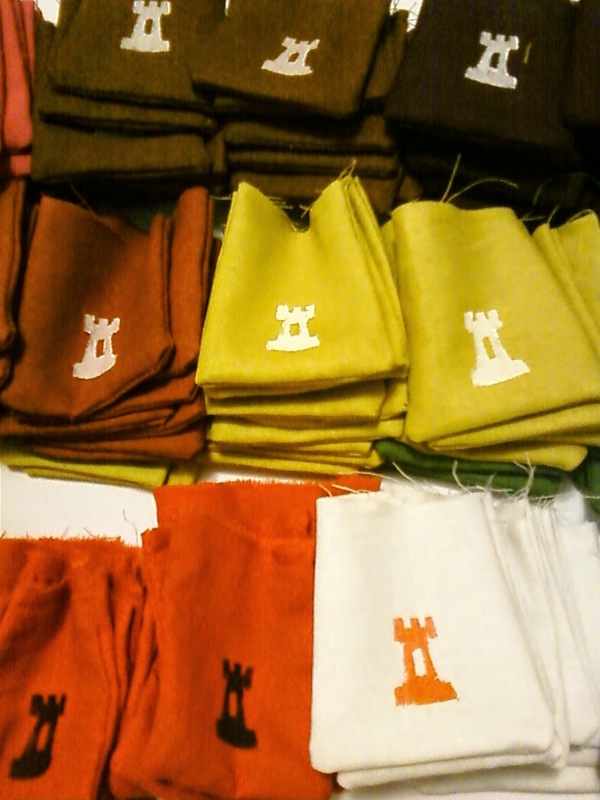 Or maybe the local heraldric colors could be inkle woven or made into simple kumihimo, and small pieces sewn to a corner of the napkin/cloth. Small pieces of cloth are useful in so many circumstances. Would you like to have one of those as a site token?